Today’s hot-selling Chardonnay will sell out. Please be sure to place your order early. Once we run out, you won’t be able to purchase this wine again. Today’s Carneros Chardonnay, from Pine Ridge Vineyards, is an truly exceptional wine with exceptional character. If you are a fan of Napa Valley Chardonnay, then this wine belongs in your collection. Subscribe to our Daily Dispatch (above) and you’ll always know what our Top Secret coupon code of the day is. Every day we issue a new members-only code that entitles you to have Ground Shipping included and, sometimes, an added discount! Look – Light golden yellow, with perfect coloration, from edge through the core of the wine. After swirling, tall, thick, slow-moving tears form high up on the glass wall before marching slowly downward. Smell – Lush and verdant, this wine leads with mixed, sweet citrus, lemon curd, acacia, braised green fig, white pear and orange blossom. As the wine warms a little, it exudes freshly cut sweetwood, lemongrass, dried apricot and green apple. Feel – Soft and velvet-smooth as it crosses the front of the palate. At the mid-palate, the wine is round and lush. After a moment, a soft dryness begins to spread from the front of the palate, traveling rearward. This dryness carries the bright acidity of the wine to the far corners of the palate, driving the soft flavors of the wine as it moves. Taste – Delicious and elegant, with layers of flavor. In the lead, mixed citrus, Granny Smith apple, white peach, pear and white flowers. As the wine opens, additional flavors follow on, including creamed honey, Asian pear, fresh apricot, vanilla and softly toasted oak. Finish – Long and lush, with a unique dryness that begins at the tip of the tongue before traveling backward onto the rest of the palate. As this dryness spreads, the balanced acidity of the wine carries sweet and tart flavors along with it. 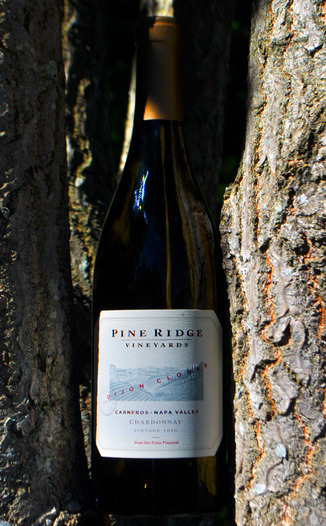 Conclusion – The 2010 Pine Ridge Vineyards Dijon Clone Chardonnay is a truly spectacular wine. We only wish that we could have gotten our hands on more of it. Our tasting panel expected great things from this wine, having reviewed a couple of past vintages, here. We were all more than impressed, unanimously agreeing that this wine is the best white that we have ever tasted from this Wine Spies favorite winery. Elegant, fresh, delicious, soft and loaded with intrigue, we give this wine our very strong recommendation. Don’t miss out. Quantities are limited and we will sell out. The location of the Pine Ridge Winery in the Stags’ Leap district in Napa County can be seen in this satellite photo. Golden and luminous, this vintage of our Dijon Clones Chardonnay enchants the nose with an array of ripe lemon, fresh kadota fig and candied pear fruit, swirling with wisps of caramel, English toffee and cinnamon bark. The entry is smooth and supple, filled with delectable pomelo, juicy apricot and Granny Smith apple pie flavors, meshed gorgeously with touches of vanilla bean, lemon cream and sweet toasty oak through the long, crisp finish. Vineyards: Overcast mornings and cool afternoon breezes contribute to a slow and even rate of maturity of the fruit, leading to an optimal balance of sugar and acid, and an outstanding intensity of fruit flavors. Closely planted to 3.5’x 6’ spacing with devigorating rootstock, our Carneros estate vineyards feature Dijon Chardonnay clones 76, 95 and 96. Harvest & Winemaking: The 2010 vintage was cooler than usual during the growing season, but ended with a heat wave. As a result, our Chardonnay was harvested at an optimal level of ripeness in mid-October. The fruit was hand-harvested at night and quickly sorted and pressed. The wine was fermented in 40% new French oak barrels, aged for six months sur lie, and stirred occasionally to promote complexity. In order to preserve bright acidity and citrus notes, malolactic fermentation was not allowed to occur. Food Pairing: Delightfully well-rounded, this beautiful Chardonnay would partner perfectly with a seafood dish, such as a gratin of mussels or spicy calamari and chickpea salad, although it is versatile enough to also pair alongside poultry or vegetarian dishes as well. This wine is also well-suited to match Bûcheron, a French goats’s milk cheese. What does it take to make a world-class wine? Before setting out to make one of our own, we asked ourselves this fundamental question. Looking to the most esteemed winegrowing districts of France for our answer, we found that the greatest of the great embrace three principles: pride of ownership, profound stewardship of the land, and a relentless dedication to quality. These values were already reflected in our vineyard management and our winemaking-in our dense plantings, meticulous pruning, and hand harvesting; in our artistic blending and careful selection of coopers—but our goal was to surpass our best. Building on the groundwork laid by the founders, we set out with ardor and high aims for our vineyards, our winery, and our wines. We would care for every vine as if it were our only vine and design a grape reception and sorting process second to none. Within a year of starting, we rebalanced the vines and completely revamped our grape-handling procedures. Every vintage since has been testament to the success of our viticultural and enological pursuits. After a long and thorough search to find the successor to a winemaking history dating back to 1978 when the winery was founded, Michael Beaulac has been appointed Winemaker and General Manager at Pine Ridge Vineyards. Inheriting the role shaped by Stacy Clark for over 25 years, brings his expertise in winemaking with an emphasis on Bordeaux varietals from his eight years as winemaker at St. Supery Vineyards and Markham Vineyards prior to that. In his new role, Michael will oversee all grape growing and winemaking operations as well as facilities management at our winery. 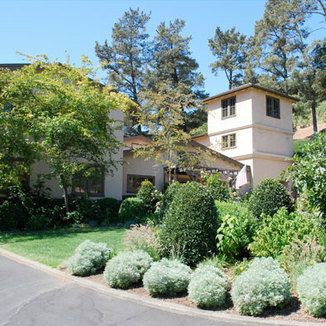 “With the winery’s exceptional reputation and collection of estate vineyards, this position is a winemaker’s dream. I look forward to working with the seasoned team here to continue to produce classically proportioned wines that are the hallmark of Pine Ridge,” says Michael.